Guernsey FC suffered the biggest defeat in the club's history as they lost 8-0 at Merstham in the Isthmian League Division One South. 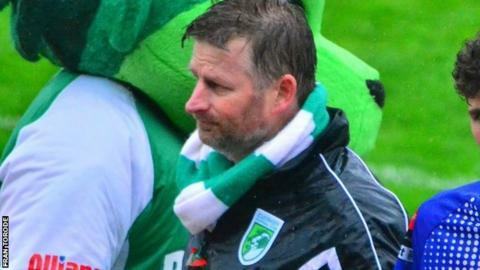 The loss was Guernsey's fifth league defeat in a row, the worst run of results in the history of the club. "We were totally outplayed tonight," Green Lions manager Tony Vance told BBC Radio Guernsey. "We gave away a cheap goal right at the start and they just kept coming at us and we couldn't get near them." Guernsey have not won in the league since they and have slipped to 19th in the table, having finished last season in fourth place. Vance's side have been hit with a string of injuries to key players such as last season's top-scorer Ross Allen, while other players have struggled to make their midweek games off the island. They have lost seven of their nine away league games this season, and have been beaten in four of their five midweek away trips. "They were fitter than us, they were sharper than us, they were stronger than us and the credit I can give to them is that's the best team I've seen us play," Vance added. "They're (Merstham) fourth in the league and if they play like that every week then they will romp this league. "Watching their performance is the way we can play, the way we can put our performances in. "But we need our full bodies to that and we need to not be a wounded team and at the moment we're very wounded."